This name uses Spanish naming customs: the first or paternal family name is Sertucha and the second or maternal family name is Ereñozaga. Angel Sertucha Ereñozaga (27 January 1931  – 6 April 2019  ), simply known as Sertu, was a Spanish footballer. Mainly a central defender, he could also operate as a defensive midfielder. Born in Gatika in 1931, Province of Biscay, Basque Country, since he was a child he knew that he wanted to be a professional footballer. He started his football career with 14 years in the modest team "C.D Begoña" of Bilbao. Then, he went to C.D Mungia, to continue his formation and in the 1954–55 season he signed up by the Sestao Football Club. Then he played in first Division teams like Athletic Club of Bilbao, C.E Sabadell, C.D Osasuna, Azcoyen of Peralta, etc., due to a severe Achilles heel injury when 39 years old. 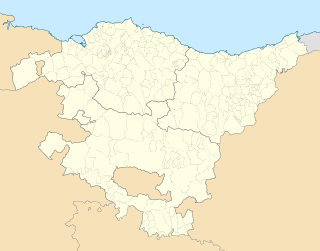 Gatika is a town and municipality located in the province of Biscay, in the autonomous community of Basque Country, northern Spain. As of 2009, it has 1,559 inhabitants. The historic Butrón castle is located in Gatika. The Basque Country, officially the Basque Autonomous Community is an autonomous community in northern Spain. It includes the Basque provinces of Álava, Biscay, and Gipuzkoa. Centre d'Esports Sabadell Futbol Club, S.A.D. is a Spanish football team based in Sabadell, a city in the province of Barcelona in the autonomous community of Catalonia. Founded in 1903, it plays in Segunda División B – Group 3, holding home games at Estadi de la Nova Creu Alta. Angel Sertucha’s retirement was not his last moment in football; after his retirement in 1969, he worked as a football coach in his first team, C.D Mungia. When he was in his third season, he decided this was not his place and his choice of professional career, so he decided to give up completely the life around football to open a tavern in the same city, "Mungia", and to spend time with his wife and his son and daughters. Athletic Club, also commonly known as Athletic, is a professional football club, based in Bilbao, in the Basque Country (Spain). Guillermo Gorostiza Paredes was a Spanish footballer who played as a forward. In a 14-year professional career, he played for Athletic Bilbao and Valencia, amassing La Liga totals of 255 games and 178 goals and winning 11 major titles with the two teams combined. Roger García Junyent, known simply as Roger, is a Spanish retired footballer who played mostly as a left midfielder. He possessed a strong shot, and was known for his passing ability. 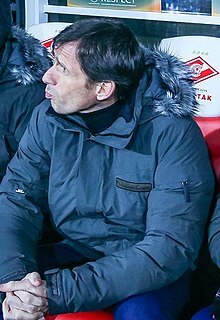 José Ángel 'Cuco' Ziganda Lakunza is a Spanish retired footballer who played as a centre forward, and is a current manager. Not to be confused with Andorran footballer Genís García Iscla. José Francisco 'Txetxu' Rojo Arroitia is a Spanish retired footballer and coach. Luis María Aguirre Vidaurrázaga, better known as Koldo Aguirre, is a Spanish retired football midfielder and coach. The Republic's Cup 1931 was the 31st staging of the Copa del Rey, the Spanish football cup competition. Roberto Jorge D'Alessandro di Ninno is an Argentine retired footballer who played as a goalkeeper, and is a current manager. Álvaro Peña Herrero is a Spanish footballer who plays for Albacete Balompié mainly as a central midfielder. Íñigo Eguaras Álvarez is a Spanish footballer who plays for Real Zaragoza as a central midfielder. Kepa Arrizabalaga Revuelta is a Spanish professional footballer who plays as a goalkeeper for Premier League club Chelsea and the Spain national team. He is sometimes referred to mononomously by his forename. Alejandro "Álex" Remiro Gargallo is a Spanish professional footballer who plays as a goalkeeper for Athletic Bilbao. José María Amorrortu Prieto is a Spanish retired football forward and manager. 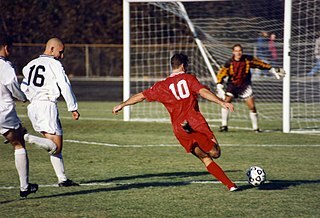 Fernando Quintanilla Barañano, also known by the nickname Txirri, is a Spanish former professional footballer who played as a central defender. He featured in La Liga for Athletic Bilbao but spent most of his playing career in the second and third divisions, including spells with CD Málaga and Real Betis. ↑ "Fallece el exjugador Ángel Sertucha". www.athletic-club.eus (in Spanish). 2019-04-06. Retrieved 2019-04-06.